We are a registered, NJ non-profit corp. and 501(c)3 tax exempt public charity, parrot and bird rescue located in Woodbridge New Jersey. We are on the New Jersey Department of Fish and Wildlife's list of recommended avian rescues. We are a safe haven for birds and parrots of all sizes. We gladly take in birds with plucking issues, screaming issues or any other type of medical or behavioral issue. Of course birds with none of these are always welcome too. 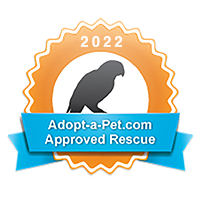 With time, patience and proper vet care, we do allow our birds to be placed up for adoption. It was a little over 5 years ago when I personally came across my first neglected bird. He was an African Grey Timneh. He had spent 16 years in a cage that was not suitable for even a canary. His feathers had been plucked all out. He was stuck in one spot. The reason he was stuck in one spot is because due to the lack of space in his cage, lack of toys and lack of perches he spent most of his day in one spot. His toe nails actually grew around the perch immobilizing him. He was forced to stretch to do even the simplest of things including eating and drinking. He was a "craigslist" bird. After reaching the gentlemen who owned him, getting to his home and explaining how bad the situation actually was for his bird, he surrendered him to me. I come from a background of birds, having grown up with a large macaw and cockatoo. I knew two things leaving this man's house. First and foremost, this was going to be a long process. Second, this was not going to be cheap. After getting him to my avian vet, cutting the cage literally in half and helping the vet anesthetize our little Timneh, we were able to slide the perch out from in between his feet. He required 6 different surgeries to make it so he could perch properly. It was a long battle, to say the least, but our Mr. Iggy Bird has made a complete and full recovery. He is now fully feathered, able to perch and has become quite the sweet little character. It was after realizing that Iggy was not the only bird in this situation, that I reached out to the New Jersey Department of Fish and Wildlife and started Lonely Grey Rescue. Every time our name is said, it should serve as a reminder of our little Lonely Timneh African Grey who needed rescuing. As such we consider Mr. Iggy Bird to be the patriarch of our rescue. I am Dan Radzik, owner of Lonely Grey Rescue. I am an avid bird and parrot lover. I have experience with several different species of parrots and birds alike. My knowledge base is deeply rooted in Macaws, Cockatoos and African Greys. Through both research and experience I have developed a very unique process for working with birds/parrots. I, along with my volunteers will work with any and all species of parrot or bird, never accepting that, "they are too far gone," to become loving members of a family. With new parrots being neglected, abused, ignored and just plain forgotten about daily, I decided it was time for a change. Ghandi said," The greatness of a nation and its moral progress can be judged by the way its animals are treated." We, along with some of our fellow avian rescues, are now, and will continue to be, battling for our feathered friends both large and small. Click on our Cockatoo and vote for us as one of the Top 100 Avian Rescues! Meet Some of Our Beautiful Birds and Their Adoption Stories! These beautiful birds have found forever families and wanted to share some of their happy pictures with you! Check out the entire website to watch more slideshows of Happy Tweets! Follow the birds' antics on Instagram! Follow the birds' antics on Instagram! Also, tag us in your photos of your visit with LGR and pictures of your flock!